Copyright© 2007 - 2012 by Robert Speik. All Rights Reserved. 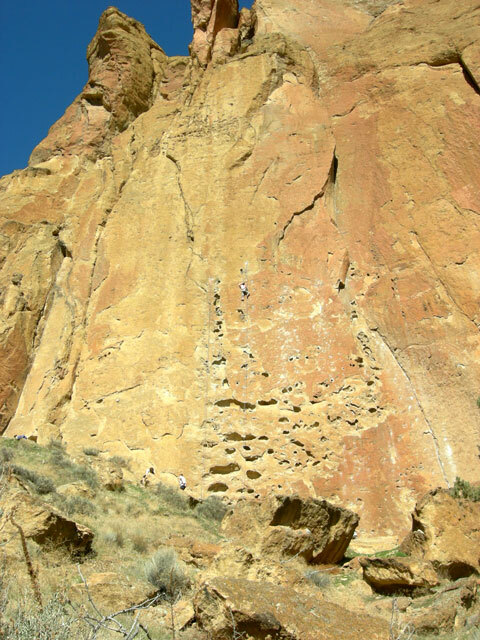 Each year, there are many Smith Rock State Park hiking accidents of the type shown in the photos above. 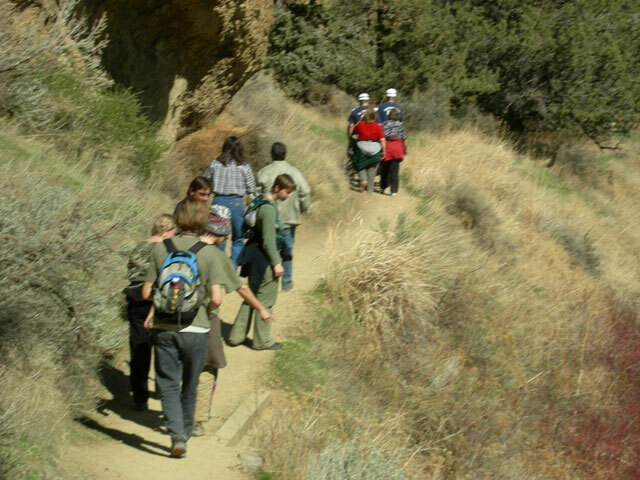 The well maintained trails at Smith often have short steep sections made "slippery" by small natural gravel over the hard ground or rock of the trails. 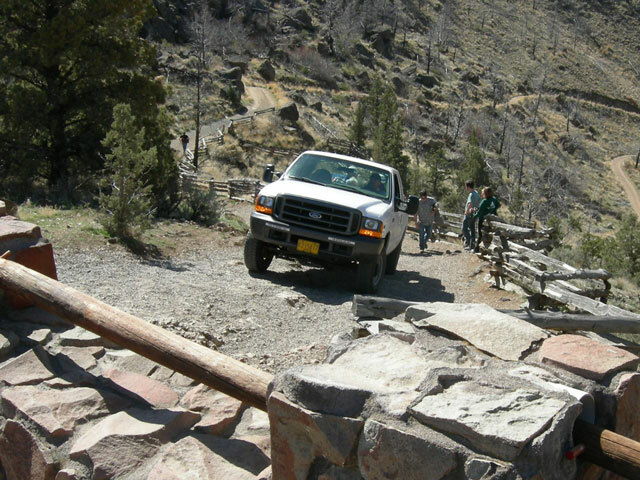 Park personnel and visitors need to be alert on these sections. 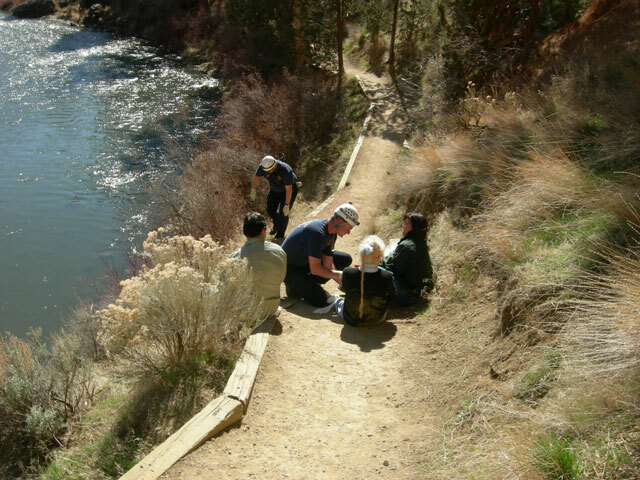 An estimated $200,000 has been spent since 1994, on the two most difficult hiking trails in Smith Rock State Park. 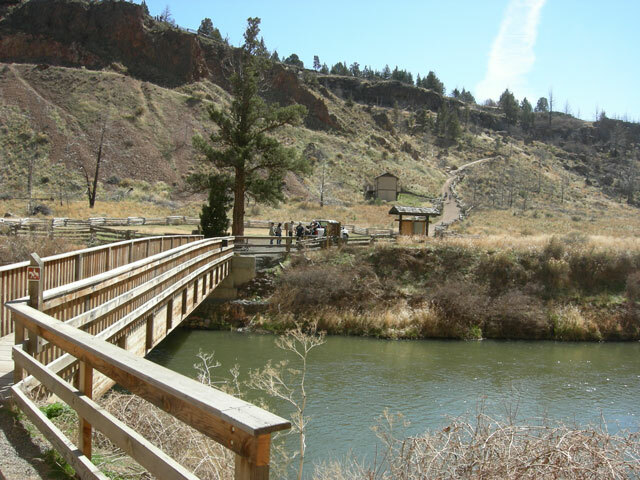 The Misery Ridge Trail and the continuing trail down the other side from above Monkey Face down to the Crooked River were re-engineered and re-built by contractors. 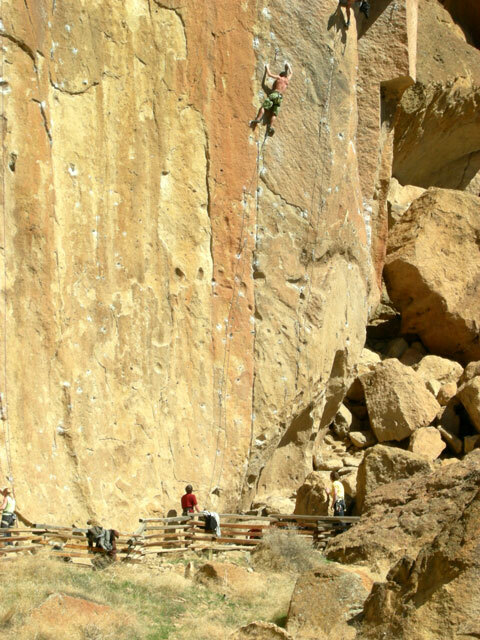 Visitors to Smith Rock State Park are estimated to number 350,000 to 400,000 per year. 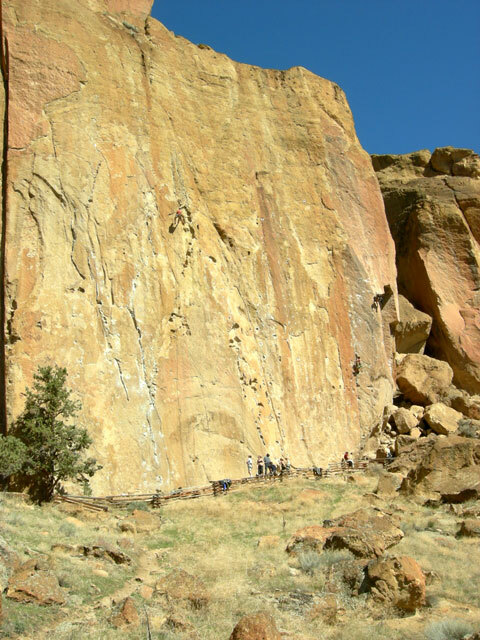 While the original success of the Park may have been due primarily to the sport climbing community, an estimated 65% to 70% of recent years visitation is from hikers, walkers, runners, bird watchers and others. The Park runs at full parking capacity on summer weekends. 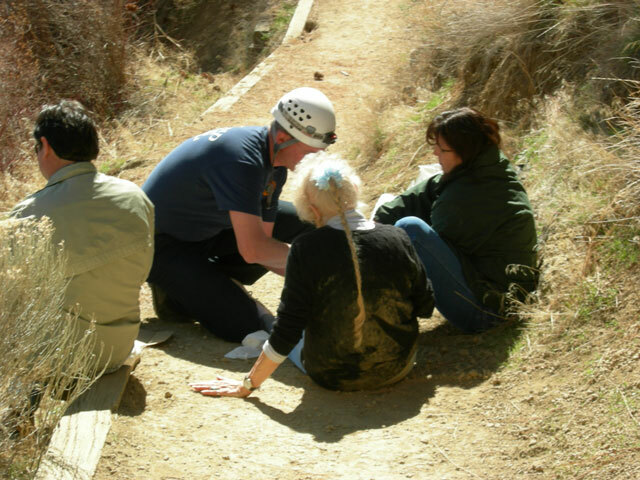 On March 15, 2007, this nice Grandmother was walking with her family along the mostly level trail along the river when she slipped and fell to the ground. She was adamant that she had broken a bone, because she had heard a "snap". She was the consummate trooper! 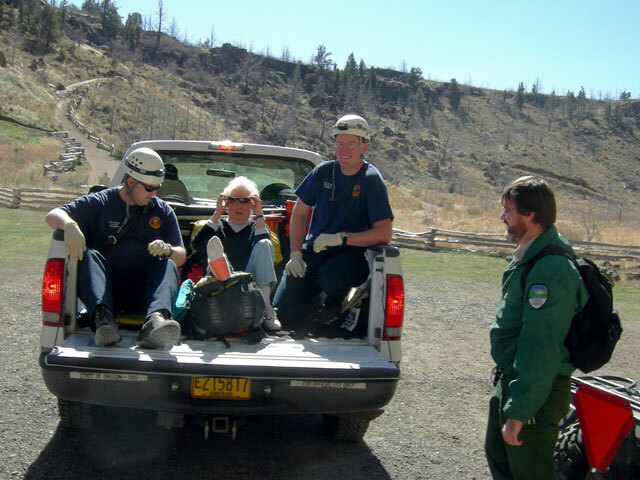 The Redmond Fire Department Paramedics splinted her leg and ankle and applied a large cold pack. I do not know if they gave her a shot of morpheme. I would have asked for something. She was cheerful through out her ordeal. 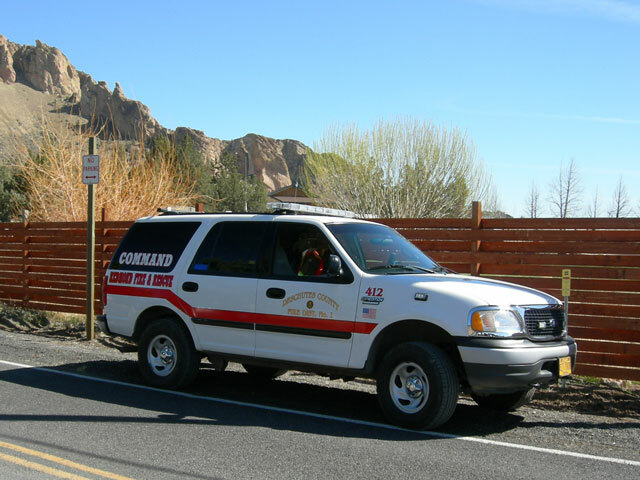 Two family members went for help and two stayed with her as the Paramedics "packaged the patient" and Smith Rock Ranger Thad Fitzhenry gave her a slow safe ride along the Crooked River and across the bridge to a waiting 4 x 4 State Park truck which took her up the steep and slippery hill to the parking lot. 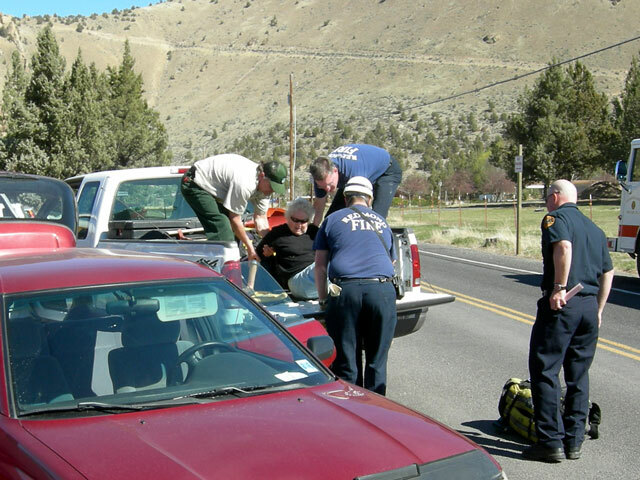 She was taken for further care, by family car to St. Charles Hospital in nearby Bend. The Rescue was fast and professional as far as I could observe. 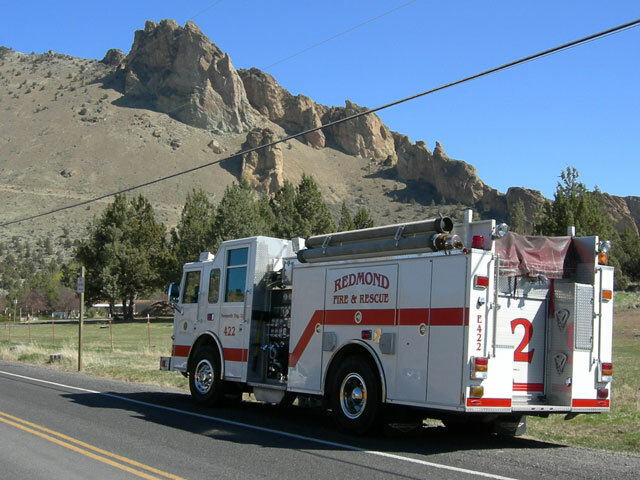 I commend the Redmond Firemen for their efficiency and compassion. I had been ready to go for a hike when the Fire Engine arrived, so Max and I followed along. We are happy we could share this experience with our readers. I did not take any names, but I spoke to her family members. Perhaps they will send me an email so that I can honor this woman's personal courage. Keep this story bookmarked and return soon for an up-date. 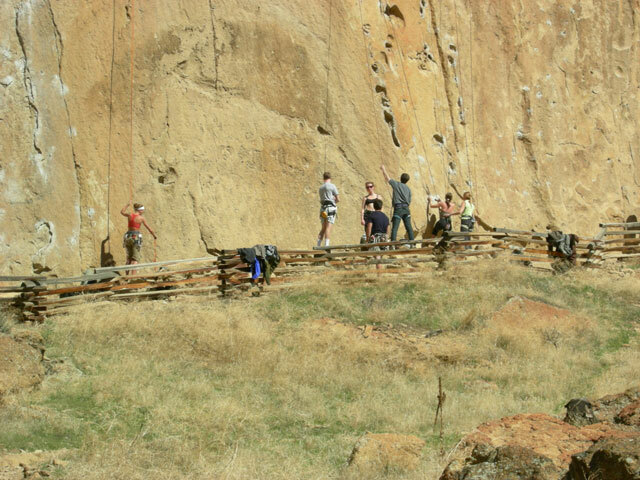 My mother is the grandmother that fell on the path at Smith Rocks. 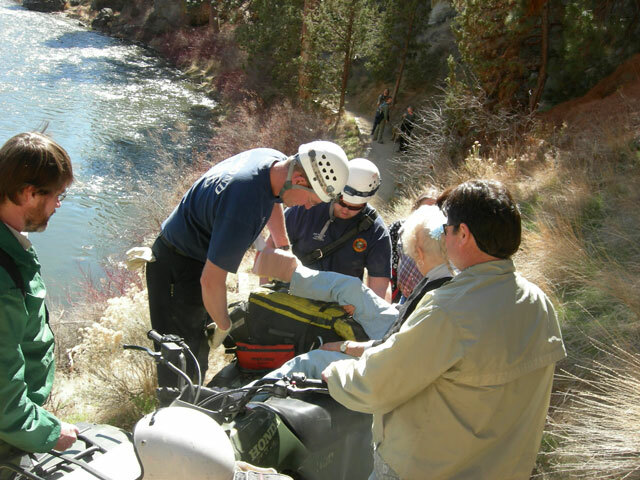 She was taken to St. Charles Medical Center in Bend. Mom broke her leg and ankle. She had to have surgery that night in which the Doctors placed pins and a metal plate in her leg and ankle. She was still smiling and joking even though in pain. The nurses thought she was just a delight. Mom did make the wedding of her granddaughter a couple of days after the fall. She is laid up for a while recuperating in Oregon and as soon as she can will return to her home and job. She wants to Thank the wonderful Redmond Fire Fighters and Park Ranger for the way they handled the situation and for their kindness. She also wants to thank the staff in the ER and Surgery for the way she was kindly treated. Mom is doing well and in good spirits. 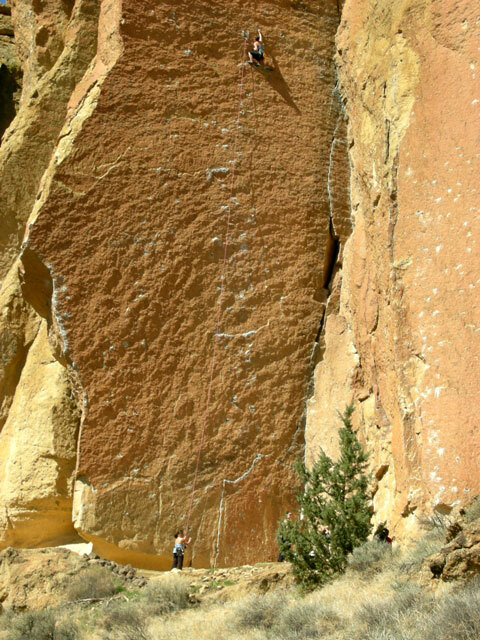 Though when we mention hiking again at Smith Rocks she thinks she will try something else. We enjoyed the pictures on this web page. Take Care.